The word cyberbullying is often used, but defining it has proved difficult. Traditional bullying is cruel behavior that is intentional, repetitive, and perpetrated by a more powerful individual over a less powerful target. These three elements are abstract, but still useful because they help researchers study a specific type of social conflict that is more impactful upon the target. In a digital environment, however, studying these three elements is challenging. When is online repetition intentional? Who has more power online? Sometimes researchers are able to study digital behaviors that clearly meet criteria for bullying, but at many other times it’s less clear. Imagine, for example, a child who sends a rumor to two or three friends via text message, not considering that the rumor could spread like wildfire through her school’s study body and result in months of humiliation and harassment for the target. In such a case, understanding intent, repetition, and power is much more complex than in traditional bullying. Despite this fundamental limitation, researchers have noted that cyberbullying is clearly associated with traditional bullying much, but not all, of the time. It is also clear that cyberbullying impact targets in many ways and can be damaging, emotionally, socially, and academically. To improve our understanding of digital interactions, researchers need to better define and understand the nature of cyberbullying and other forms of digital conflict and cruelty, including online harassment and sexual harassment. We also need to consider how the use of digital communication devices change interactions, and how all this information can be applied to develop effective and useful prevention programs for children and adolescents. Cyberbullying is defined as “willful and repeated harm inflicted through the use of computers, cell phones, or other electronic devices.” It can involve targeting a victim through the use of messages, pictures, and social media, through any digital device. Can monitoring my child’s phone keep them safe from cyberbullying? Using parental monitoring software, or apps, can help keep you informed about what your child is doing online when they’re using their phone. But these apps don’t take the place of conversations with your child about online activities and problems. Apps alone won’t prevent cyberbullying, but they may let you know about problems after they’ve happened. Teaching children how to use digital devices can reduce the chances of cyberbullying involvement. And, of course, it’s important to remember that there are many computers and devices in many places that any child can use. But like most social problems between kids, it’s impossible to avoid it with 100% certainty. Discussing common problems online, and how to address them, can help children cope with cyberbullying if it should happen. How can I help my child if he or she is being cyberbullied? The most important help a bullied child can have is support. That may mean spending time with friends; getting emotional support from their family; and/or getting professional support from their physician or counselor. Spending some time off-line can help as well, especially if that time is spent in fun activities with family and friends. Cyberbullying and bullying commonly overlap, so the older a child is, the more likely it to that the two types of bullying are happening simultaneously. Bullying and cyberbullying are both serious, and they can both result in social, emotional, and academic problems. Take either problem seriously if it occurs. Cyberbullying is not separate from school; in fact, it often interacts with traditional, in-school bullying. The older the child, the more likely it is that cyberbullying is involved with in-school problems. 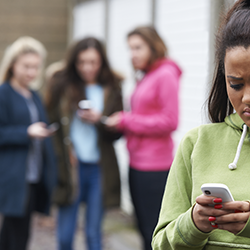 Cyberbullying can have a significant emotional impact upon children and teens. Unlike traditional bullying, a target cannot escape cyberbullying at the end of the school day. The bullying can follow a target everywhere. Although cyberbullying is clearly more common among older children, it occurs even in elementary school, where recent research suggests that 50% of children own smartphones and those children may be at higher risk of involvement in cyberbullying. As with other parts of your child’s life, the golden rule about digital technology is simply to talk about it with your child. Talking about what they’re doing online, what digital activities they enjoy, and what (if any) problems they’re having will help your child learn to think about their digital activities and to communicate with you for any support or help they may need. Don’t be afraid to ask your child to explain or demonstrate some digital activity. Kids often enjoy showing their skills to their parents (as we all know!). You’re not necessarily bringing computer expertise to this conversation — you’re bringing your life experience. When there is a social problem online, you may not always need to take direct action. Research shows that just listening and being supportive, and sometimes providing a different perspective, is among the most helpful things that adults do, according to youth who are being bullied. If a social problem persists, work with your child to notify the website or app maker about the problem. Even when the problem is only happening online, it can be a good idea to notify your child’s school, where the adults can keep an eye on interactions, support your child, and make sure that there’s no “spill-over” into school. If your child appears to be struggling emotionally, seek help from your pediatrician or the school counselor. Encourage your child’s school to use programs and curricula designed to increase internet safety and reduce cyberbullying and online social conflict. There are many resources for schools. Kids and parents sometimes experience digital technology differently. Don’t be too concerned if a social problem online (fighting, cyberbullying) upsets you more than it bothers your child. By explaining their thoughts and values and listening to your child’s feelings about a situation, both parents and kids may feel better about social problems. Look for educational materials that can help educate your child about the risks involved in some digital behaviors. Online, it’s often harder to know for sure why someone is being hurtful. Sometimes a person may be trying to hurt someone’s feelings, but at other times, they might simply be thoughtless or careless. It’s important to keep this in mind before jumping to any conclusions. Different kids respond differently when they have social problems online. Some are able to shrug off these problems, but other situations may be too hurtful to disregard. Talking about what’s going on and how you feel about it, and emphasizing the people who care (e.g., friends, family) can make many kids feel better. In a digital environment, even small actions can become quickly amplified. For example, an innocent remark can be misconstrued and spread around very quickly. Research has shown that sometimes kids are pressured by their peers to engage in online activities that they don’t really want to do – such as passing on rumors, or posting inappropriate photos. If your child talks about an incident with you, it may be worthwhile to ask about peer pressure. It’s important to remember that the behaviors we see on social media – both positive and negative – are all part of, and influenced by, the larger culture we live in. What happens on the Internet doesn’t happen in isolation. Media affects our behavior in all kinds of situations. Patchin, J. W., & Hinduja, S. (2006). Bullies Move Beyond the Schoolyard: A Preliminary Look at Cyberbullying. Youth Violence and Juvenile Justice, 4(2), 148–169.